Even as a baker who often compiles my recipes from scratch, I always keep a supply of Pillsbury cake mixes and frosting on hand. You never know when they might come in handy. I know for most of you out there, you’re working women, you’re moms, and you’re short on time. But that doesn’t mean you can’t whip up something SUPER cute for the holidays! When I was in Walmart last week, I saw that they had the Pillsbury Spring Funfetti® Cake Mix and the new Pillsbury Fluffy Frost, obviously I needed to make something fun with them because I’m all about the sprinkles and the chocolate! The proof of that is in my Mini Chocolate Bundt Cakes! 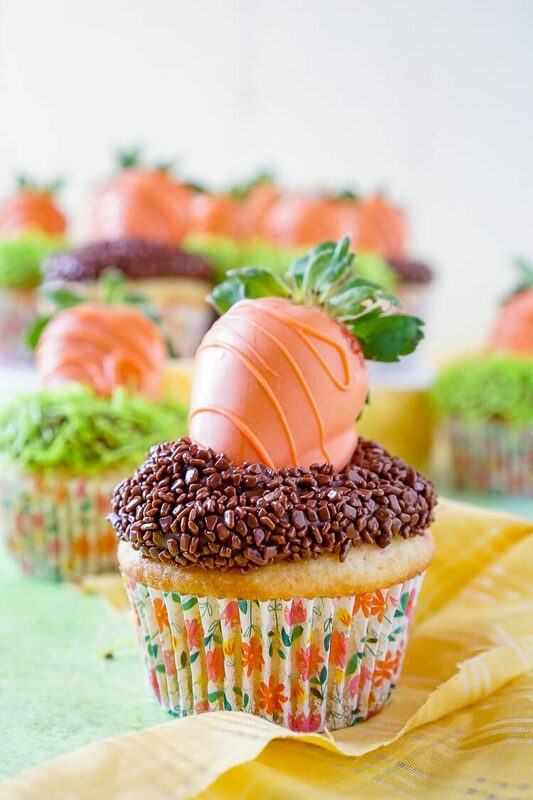 So I decided to take my Pillsbury products to the next level and mix up a moment with these Easy Easter Cupcakes. 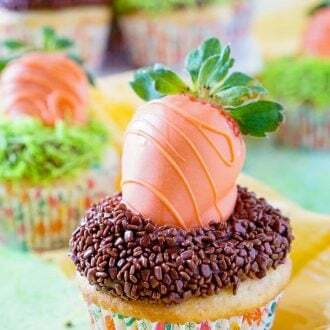 The Spring Funfetti® Cupcakes are topped with the Chocolate Fluffy Frost, then dipped in chocolate sprinkles or green candy shred and topped with orange candy dipped strawberries for the final touch. Don’t they just scream springtime? Check out the video below to see just how easy these are! These cupcakes are light, fluffy, and fun! Make them for your family get together this Easter or send them off to school with your kids for the holiday parties. 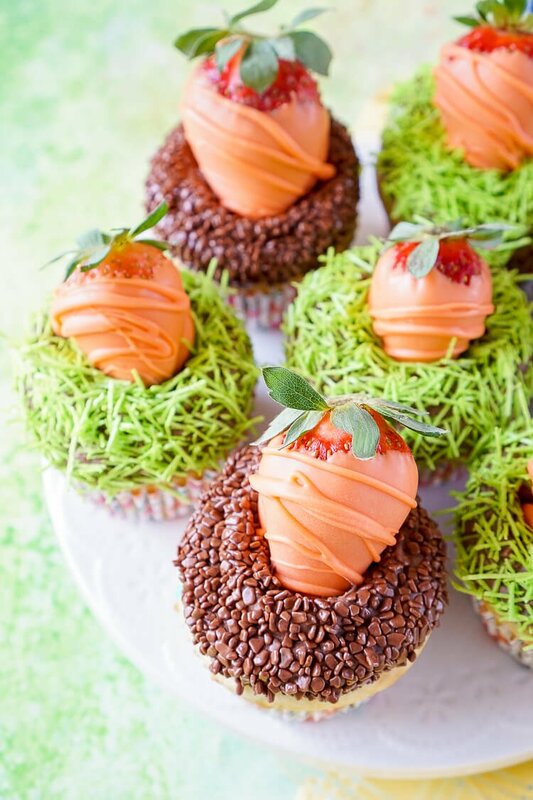 In fact, you should make them together, decorating cupcakes is just as much fun as decorating Easter eggs. Actually, they might even be better than that because you get to eat them after! 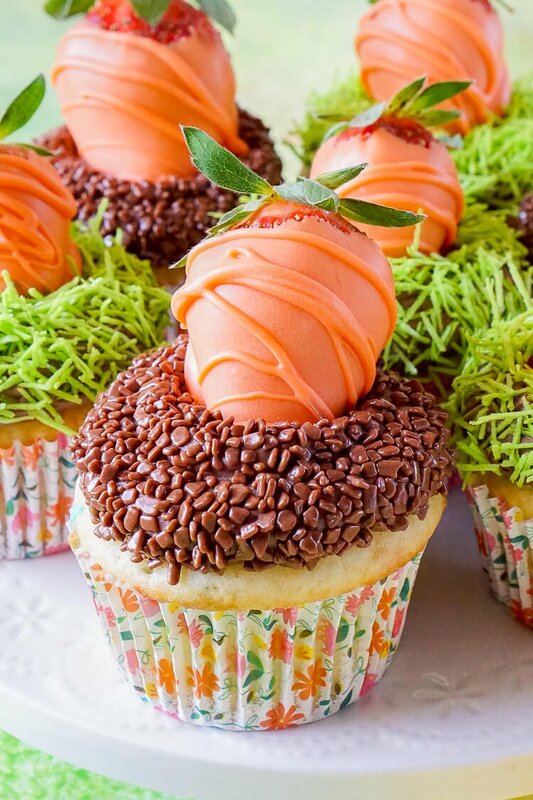 Pin these Easter Cupcakes for Later! Melt the candy melts in the microwave on 30-second intervals, stirring in between, until completely melted. Dip strawberries in the candy and place on wax paper to set for about an hour. Beat together cake ingredients until smooth, fill each cupcake liner until it's 2/3 full. Bake for 19 to 23 minutes. Let sit in the pan for a few minutes before transferring to a cooling rack to finish cooling. Bake off the remaining batter. Pipe Pillsbury Fluffy Frost onto cooled cupcakes with a large circle tip. Add sprinkles and candy shred to two separate, small bowls. 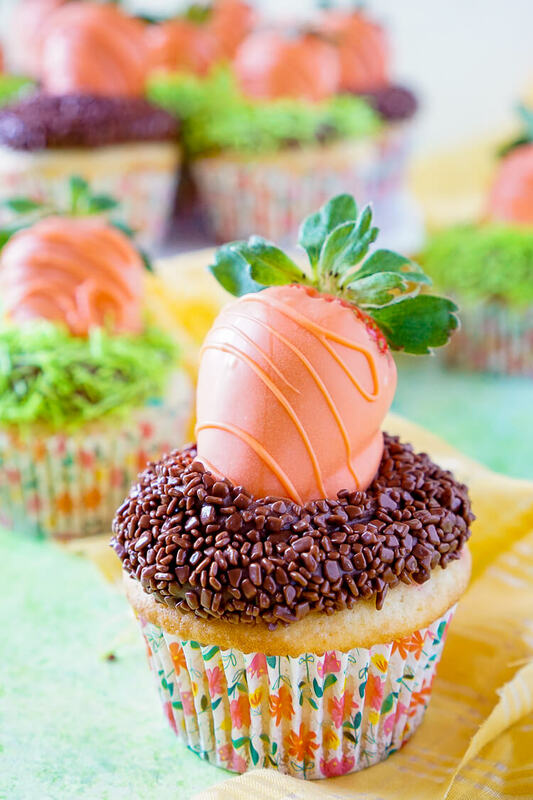 Tip the cupcakes frosting side down into one of the toppings and pull away, top with a carrot strawberry. Repeat for remaining cupcakes. This decorating method can be used with any of the Pillsbury Cake and Frosting flavors!